Location: Bartholomew Close, Barbican, London UK. Here is a quick preview showing a selection of preliminary images I took of the Barts Square residential development, a scheme currently taking shape in the City of London, just north of St Paul’s Cathedral. I say preliminary since it is a rather large 3.2 acre phased development , comprising offices, retail and the aforementioned residential units, 236 to be precise. The project is being master planned under the direction of lead architects Sheppard Robson who have brought in architectural practices Maccreannor Lavington and Piercy & Company to act as sub-consultants on the scheme. The residential aspect of Barts Square comprises an assortment of architecture where historically significant buildings have been retained and woven into the fabric of the contemporary structures surrounding them. 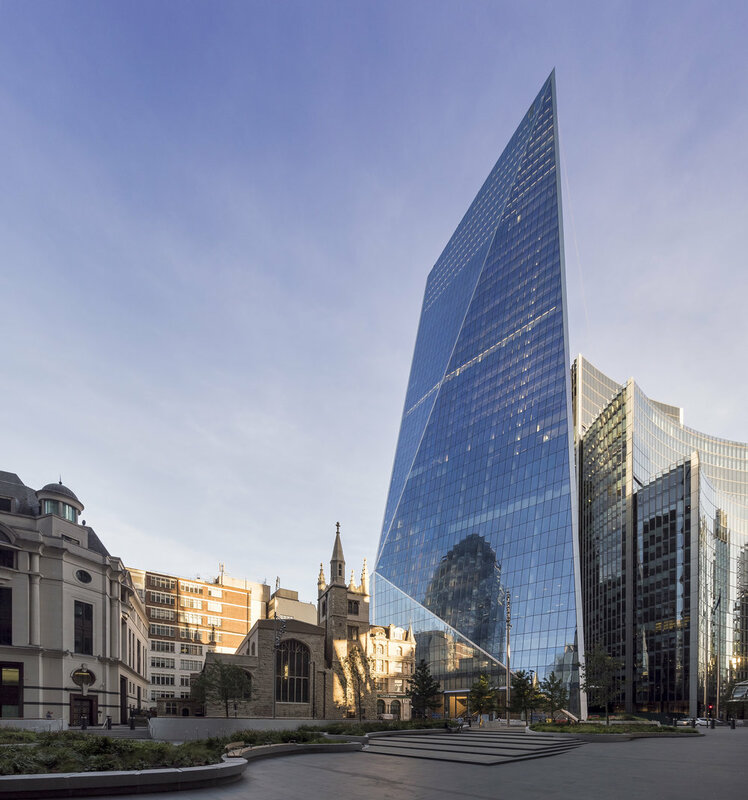 In keeping with the strict guidelines for developments in sensitive areas of the City of London the materials and designs of the new builds are high quality and reference both the historic and environmental context in which they find themselves situated. The new buildings snugly fit into the existing narrow street patterns creating enclaves of privacy for the residents and a labyrinth like structure intrinsic to Victorian-era urban planning, causing all but the savviest Flâneur to retrace their steps as they wonder how on earth they entered the complex and if they will ever make their exit. The apparent tranquility seen in the photographs presented here belie the hustle and bustle of what is still a partially active construction site. Once again my already depleted reserves of patience were put to the test as each time I positioned my camera and tripod to take a shot, a fluorescent clad worker or delivery truck would, as if by magic, manifest within my field of vision. During such testing circumstances it is often only a split second, where the perfect conditions align, and sun, pedestrians, architecture all fall into an evanescent, harmonious synchronicity, before instantaneously collapsing before the lens back into the cacophonous muddle of urban life. These photographs of Barts Square were commissioned by my client Sheppard Robson to capture the completed buildings from the first phase of the development. While limited in the scope of what could be captured on that day, hopefully they offer a glimpse into what will be a high quality development when all eventually comes together in the final stages of construction. When time permits I will add a more comprehensive set of images showcasing some of the luxurious interiors of the residential buildings which are now partially occupied. If you are to pick up a copy of the 2019 London Tall Buildings Survey and make it to page 103 you will glimpse a photograph I took of Kohn Pedersen Fox Architect’s 52 Lime Street Building (The Scalpel), a 42 Storey, 190 meter tall, skyscraper located in the City of London just a stones throw from the The Gherkin skyscraper where all this reverence for height began. The publication is available to download for free, or you can pick up a physical copy by dropping into the The Building Centre near Goodge Street station in central London. Location: North Kensington, London, UK. Located in the shadow of the elevated A40 road in North Kensington is Bay 20, a plot of land owned and operated by the Westway Trust. The contentious history of the site and the multifarious visions that came and went with the years that it intermittently lay in a state alternating between occupation and dormancy, are well documented in an article by Isabelle Priest in the RIBA Journal. In the wake of the tragedy that was the Grenfell Tower fire in 2018, these unused spaces were utilised by the local communities as places to convene, although the Bay 20 plot remained inaccessible; a dark, desolate space that prompted avoidance. Fortunately this state of impasse was to come to an end when, after the fire, directors at the BBC’s show DIY SOS decided to create something for the community in the area. Working within a two to three week build time the project sought to involve the local residents in the project as much as possible, consulting their opinions at various stages throughout the design process. The suppliers of materials and building contractors, all charitably offered their services free of charge and the architectural practice Featherstone Young were approached to create designs for the two buildings that were to occupy the site. One of the buildings, it was decided, was to be the new home to the Dale Youth Boxing Club, which had formerly been based in the first floor of Grenfell Tower. This was the particular building for which I was commissioned to photograph both the interior and exterior spaces, by the client Kalwall UK, whom I had previously worked on a number of interesting projects with, such as West Croydon Bus Station and the Benenden Hospital Redevelopment. For the client this was an unique project as it saw their Kalwall curtain walling integrated seamlessly with intermittent panels of glazing, the product making up nearly the entirety of the external structure. As with the previous projects I had photographed by day these semi-opaque panels allowed natural light to gently permeate the buildings interior, while at night inverting this effect. Dictated by the contours of the site the new Dale Youth Boxing Club fits snugly underneath the flyover and features, over its two floors, a fully equipped training area, boxing ring and changing rooms. On my final visit to photograph the project in the early evening it was great to see the local residents, especially the children, making use of both the new walkway that the site has opened up and the facilities it offers -uninhibited by the anxiety that the site once projected. In the evening the space really comes to life with the gym’s internal light illuminating the building and the colourful panels of the community centre opposite creating a welcoming environment. For those interested in seeing the project come to life, it’s conception, design and construction was featured over two episodes of the BBC’s DIY SOS programme. Like all new developments, their is often an air of apprehension and distrust in the local community as to how much they will benefit from them, but it is safe to say from my own visits to the site that these fears have been allayed and the locals, especially the children have really embraced the project and are already making great use of it. In terms of both architecture and materials Bay 20 and The Dale Youth Boxing Club exemplify the transformative power of architecture and what can be done with limited resources, space, and a potentially oppressive location. The hard work of all those involved and their charitable donations have created a wonderful space where the local community can come together and experience a place that they helped to shape. It is sometimes these smaller, community based projects that make architectural photography such a rewarding profession; witnessing the local children and parents utilising and having fun in the space is surely sign of a successful endeavour. In late 2016 the London Design Museum opened the doors to it’s new premises in Kensington, located just on the periphery of the then autumnal setting of Holland Park. Having outgrown their previous home on the riverside in Shad Thames - now occupied by Zaha Hadid’s architectural practice - they museum opted for the grade II listed former Commonwealth Institute building to become their new home. Having stood unoccupied for a number of years, the building, with its iconic copper roof and parabolic form, provided a perfect shell for the architects to work with, as well as embodying the nuanced design sensibilities which the Design Museum aspired to present to the visiting public through its collections and exhibitions. A team of several architectural practices were enlisted to work on the project with John Pawson taking responsibility for the Interior space and both OMA and Allies and Morrison handling the refurbishment of the external structure. The extensive works carried out by the contractor Mace and structural engineers Arup, included a significant reconfiguration of the structure and excavation of the basement to increase floor space. To meet modern building standards the external facade had to be completely replaced, while still retaining the blue-glass appearance of the original building. Over a year after its initial opening I was commissioned by the client Troldtekt in the Spring of 2018 to photograph the London Design Museums Interior spaces; public viewing galleries, paid exhibition areas, library and research facilities and office space. Upon entering the building the first thing that greets your vision is the vast atrium which rises 4-stories and is capped by the amazing parabolic roof structure. Displays adorn the natural wooden walls, staircases and corridors emerge connecting the various levels of public exhibition space, while those heading to the basement level will find themselves in the chargeable, temporary exhibits. The internal space created by John Pawson’s design team lends itself perfectly to the architectural photographers lens, with intersecting planes that frame the museum’s visitors and the expanse of space created by the atrium which exposes their activity at all levels. The permanent exhibitions of the upper levels detail the history of design, showcasing an array of nostalgia inducing gadgets extracted from the recent past and presented anew for our curiosity. These exhibits, not surprisingly, utilise a design aesthetic of the museums own making so as to distinguish information, ease navigation and engage its audience. To see more images of the London Design Museum which I took during my visit, including some of the recent Ferrari exhibition please head over to my project portfolio, or better still plan a trip to the museum yourself, it is truly a wonderful space to explore.